My current work focuses on social and political contemporary issues. At the same time I have been exploring the relationship between space and illusion. I believe that the term “space box,” which Erwin Panofsky coined in his essay “Perspective as Symbolic Form,” is a good description of my current work. 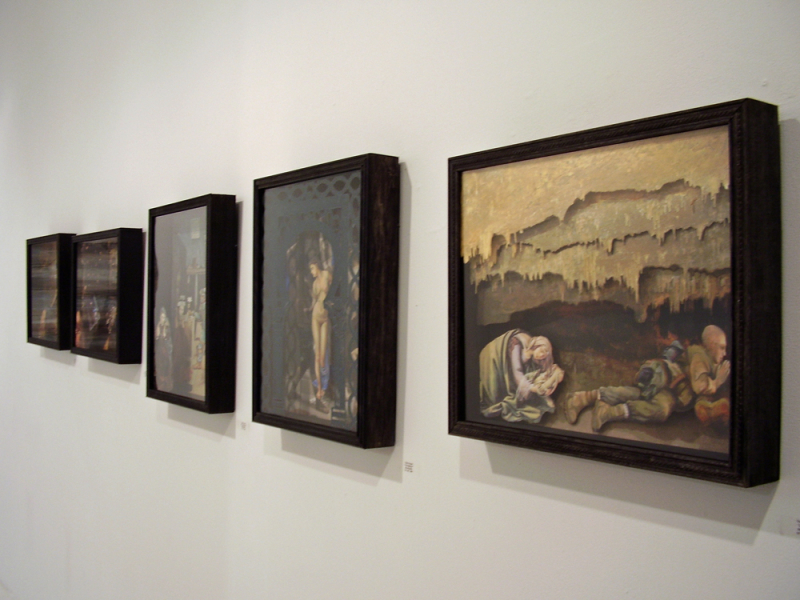 These boxes have also been referred to as dioramas and compared to the works of Joseph Cornell and Betye Saar. I believe the comparison to Saar is more accurate, however my boxes incorporate drawing, oil paint and prints on cut paper as opposed to found objects. Creating a sense of space and the illusion of depth is a technique I use to draw the viewer into the work. Although much of my work is created by hand, the interest in space ironically was inspired by contemporary digital animation. Some of the issues in contemporary art that I explore through my work are the denial of illusion, the intersection of 2-dimensional and 3-dimensional art forms, and the tension between beauty and politics. The connection, and oftentimes conflict, of the sacred and the temporal is the basis of my work, expressed through a synthesis of images from contemporary mass media and religious or mythological art history to form visual analogies. The creation of analogies between contemporary and art historical imagery underscores the cyclical nature of history and seemingly unending conflicts of ideologies. Although I incorporate religious themes into my work, my focus has been primarily on the political/social issues of today. My interest in religious and mythological imagery stems from my passion for Renaissance and Baroque art. I am also interested in the layering of themes found in these works. It is my hope that my work brings to mind the separation between church and state and the needless tension between the two in contemporary society. I am attempting to use the mystique surrounding fine art to call attention to issues in the media that might be overlooked by society. I believe that observable connections to the external world and to actual events are essential if art is to have any relevance to the viewer or society. With my work I implore the viewer to be wide-awake to the world.